Live Migrating a Virtual Machine from a Hyper-v 2012 stand-alone Host to WS2012 R2 Cluster and Configuring Kerberos Constrained Delegation.. | Chinny Chukwudozie, Cloud Solutions. ← Creating Resource Mailbox Resource Property Schema in Exchange Server 2010. Live Migrating a Virtual Machine from a Hyper-v 2012 stand-alone Host to WS2012 R2 Cluster and Configuring Kerberos Constrained Delegation..
After multiple attempts, I have come to the conclusion that directly moving a Virtual Machine from a Hyper-v 2012 stand-alone host to a Windows Server 2012 R2 cluster is not exactly a feasible option right now. I’ve been able to achieve this by a two step process. 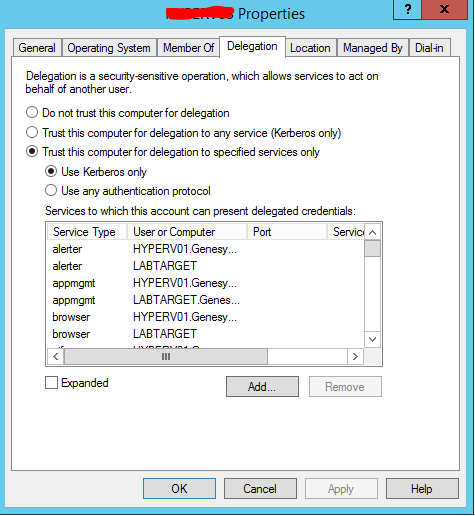 a) Move the target VM to a ‘staging’ Hyper-v 2012 R2 stand-alone host after configuring both source and destination hosts for Live Migration using Kerberos authentication and then b) successfully move the VM to the Windows Server 2012 R2 Failover Cluster c) Add the new VM Role to the cluster. At this point, I can only attribute this to a compatibility issue between WS2012 and WS2012R2. 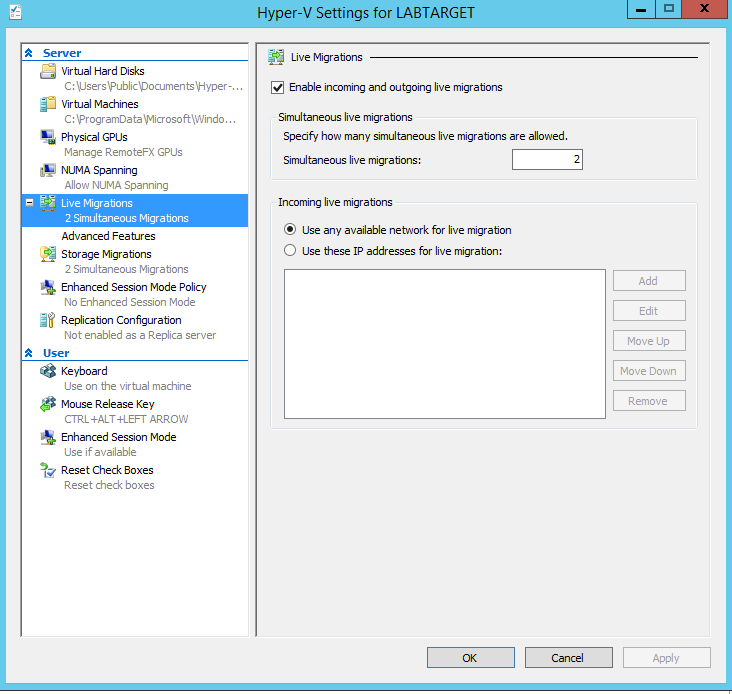 The source host is running Hyper-v 2012, while the destination host is running Hyper-v 2012 R2.Live migration settings on both source and destination machines are the same. I will write about Kerberos Constrained Delegation in a future post. The Virtual Machine move to the ‘staging’ target host completed successfully. 1) Live Migration settings on the source and target hosts, to confirm they’re the same. 2) Verify that the NetfirewallProfiles settings are the same on both hosts. 3) Configure and verify Kerberos Constrained Delegation for both hosts also. VERBOSE: Move-VM will move the virtual machine "VM01" to host "chost02"
The Virtual Machine Management Service failed to establish a connection for a Virtual Machine migration with host 'chost02': No credentials are available in the security package (0x8009030E). It occurred to me that my Cluster has several networks setup for different roles/functions. The Cluster Migration is set to run off it’s own separate network. I temporarily changed the Cluster Live Migration to run off the domain LAN. I verified the Live Migration settings on source and destination hosts again to make sure they’re on the same network, I checked the Kerberos authentication settings again and then restarted both source and destination hosts. The VM move to the cluster node was successful this time. Now we’ve successfully moved the VM to a cluster node, we’ll add it as a role to the Failover using the following . I hope this helps point someone in the right direction if they’re having problems migrating VMs in a Cluster scenario. This entry was posted in Cluster Shared Volume. Bookmark the permalink.